This weekend I got a Jawbone UP to help me with my fitness journey. 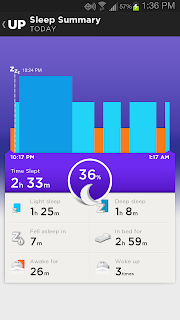 It helps you monitor your activity, your sleep, workouts, food, and even tells you when you've been idle for too long. It is really awesome. 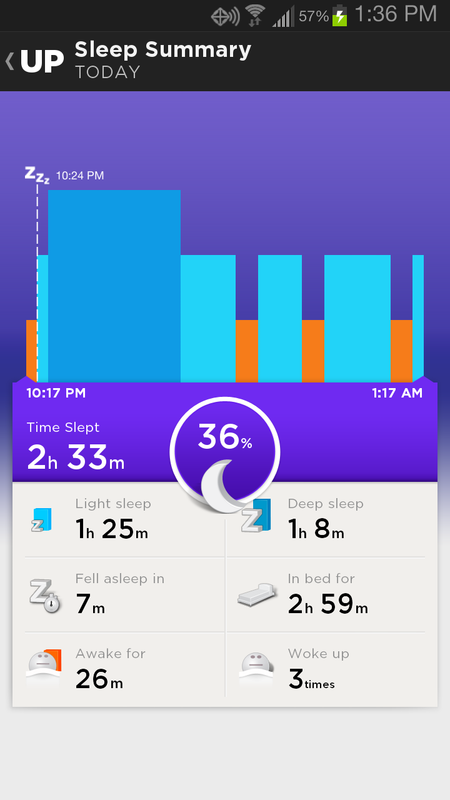 I was especially excited for it to tell me how I've been sleeping. I was pretty disturbed when it told me I only got 2 hours of sleep. In fact...it took me until about an hour ago to figure out it stopped recording at 1:17AM. That would be the time that I was up for a long time out of bed with Christopher who had a hard time getting back to sleep because he's kind of stuffy nosed. Apparently the UP is much too smart for me. Note, if I'm out of bed for an extended period of time, I have to tell it I'm sleeping again. Anyway, on the subject of being sleep deprived, we have got to make some changes to bedtime and sleeping with the boys. I can't take it anymore. So, we are going to be trying some crying it out type stuff. I know that they can handle being alone in their rooms, I just need to train them to get themselves to sleep. Actually, it's the going back to sleep part we need help with.